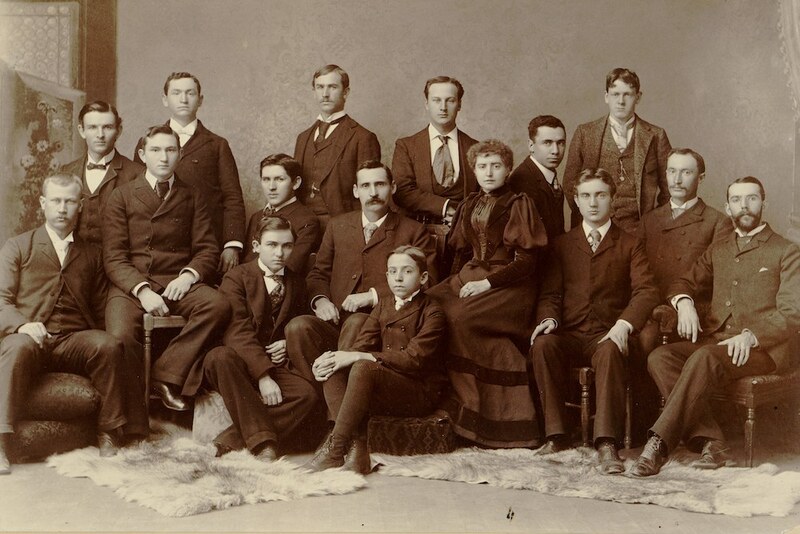 Mormons from Utah and Idaho studying at Harvard, MIT, and the Boston Conservatory, 1893. The presence of a Mormon 'colony' at Harvard was a subject of public controversy when Harvard's famed president, Charles Eliot, visited Salt Lake City the previous year. Courtesy of Church History Library, Church of Jesus Christ of Latter-day Saints, Salt Lake City. The answer lies in understanding how Mormons determined that a pact with America was not a deal with the devil. It also lies in American universities. In the same period that animosity between Mormons and non-Mormons reached fever pitch (the two decades between the death of Brigham Young in 1877 and Utah’s admission into the Union as the 45th state in 1896), a rising, influential generation of Mormons began attending the nation’s universities. On those campuses, Mormons enjoyed a rare, revivifying freedom from both outside aggression and ecclesiastical oversight. 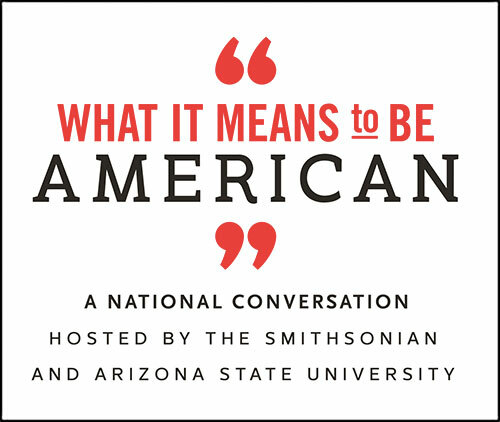 For them, the realm of American higher education was one of genuine dignity, hospitality, and meritocracy; it was a liminal, quasi-sacred space where they would undergo a radical transformation of consciousness and identity. As a result, a generation of Mormon leaders developed an enduring devotion to non-Mormons’ institutions, deference to non-Mormons’ expertise, and respect for non-Mormons’ wisdom. These extra-ecclesial loyalties would dismantle the ideological framework of Mormon separatism and pave the way for Mormons’ voluntary re-immersion into the mainstream of American life. It was Brigham Young himself who in the 1860s and ’70s authorized the first wave of Mormon academic migration to American institutions of higher education—like the University of Michigan, the Woman’s Medical College of Philadelphia, and West Point. His hope was that a few exemplary Latter-day Saints could secure professional training in law, medicine, and engineering that would help reinforce Mormon independence. Students, however, began harboring their own diverse ambitions, and their experiences left them ambivalent at best about Mormon independence. As law students at the University of Michigan, for example, Mormons James Henry Moyle and Henry Rolapp wrote home about how they relished the opportunity to wrangle with non-Mormon classmates over Utah’s bid for statehood and the church’s legal status. They earned the clear, abiding respect of their peers not by proselytizing but by engaging them in rational discussion and debate about law and politics, leaving matters of faith off the table. Other Saints had similarly exhilarating academic experiences, which official church periodicals celebrated and disseminated for audiences delighted to know that the church’s best and brightest could succeed in the proving grounds of American academia. Each student’s dispatch introduced a distant, prestigious school—Harvard, MIT, Cornell, Michigan, the U.S. Naval Academy, even the art schools of Paris—to Mormon youth. The feature articles contained large photographs and ample descriptions of each school’s distinctive strengths, religious milieu, entrance requirements, daily routine, social life, and insider language like “quiz” and “flunk.” The students thus assumed authority as culturally bilingual diplomats who allowed the faithful at home to experience, vicariously, the thrill of being welcome in America. Richard Lyman, writing from Ann Arbor, bore some of the most ebullient testimony. He described the University of Michigan’s campus and surrounding town as “a perfect little garden of Eden.” He had arrived with fear and trembling, because Mormons tended to “go out into the world feeling that in some degree, at least, we shall be curiosities to people.” Anxiety nearly overcame him when he introduced himself to the university’s president, James B. Angell. Carefully examining Lyman’s credentials, Angell assured him, “I am very glad to see you. We have had a great many students from your state, and among them we have found only good workers.” Lyman’s relief was inexpressible. 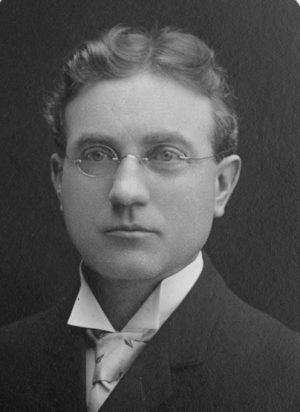 John A. Widtsoe, who graduated from Harvard in 1894, became of one the first Mormons to earn a PhD. Used by permission, Utah State Historical Society, all rights reserved. Ordinary Americans had no idea that a small cadre of Mormons was enjoying such lavish hospitality at Harvard. They found out in 1892, when the personal connections that Mormons had established with Charles Eliot led him to visit Salt Lake City. Before a crowd of 7,000 Mormons and non-Mormons in the Salt Lake Tabernacle, Eliot delivered a speech on one of his favorite topics, religious liberty. He expressed admiration for the Mormons, who, he said, resembled the early Puritans in their willingness to endure hardship and travel great distances in pursuit of a religious ideal. But reports of the speech drew a backlash. Non-Mormons in Salt Lake City and throughout the nation found Eliot’s comparison intolerable, even traitorous. Eliot only added to the storm of controversy when he acknowledged that there was indeed a “colony” of Mormon students at Harvard. The aftermath of Eliot’s speech illustrated how badly Mormons wanted to be seen as fully American, and how far most of the country still was from seeing them that way. Mormons rejoiced when President Eliot continued to defend them in the face of public criticism. “They live together,” Eliot conceded, “but they are not colonists in the sense of propagating Mormon doctrines or endeavoring to secure proselytes. They are good students, but do not differ greatly from other young men in their habits and customs.” Mormons savored the soul-stirring respect. It was Brigham Young himself who in the 1860s and ’70s authorized the first wave of Mormon academic migration to American institutions of higher education—like the University of Michigan, the Woman’s Medical College of Philadelphia, and West Point. Other leading educators beat a path to Utah in the 1890s. The ambitious and idealistic head of the nascent Brigham Young Academy (later BYU), Benjamin Cluff, who had spent years at the University of Michigan, inaugurated a series of summer schools that brought the church, and Utah, into close communion with academic royalty. Guest lecturers included Col. Francis Parker of the Cook County Normal School in Chicago (1892), James Baldwin of the University of Texas (1893), and Burke Hinsdale of the University of Michigan (1894). Hundreds of Mormon and non-Mormon teachers attended the summer schools to hear lectures on the latest methods in education and psychology. John C. Swenson, a member of the Brigham Young Academy faculty who had never set foot outside Utah, recalled that the event fueled his desire to pursue university training in pedagogy and psychology at the glittering new Stanford University, starting in 1894. As a result, by the dawn of Utah’s statehood, university-trained Mormon students possessed a new status and authority perhaps best exemplified in the career of Martha Hughes Cannon, MD. In 1896, Cannon became the first American woman to serve in a state senate—defeating her polygamist husband, Angus, in the election. She held three degrees from outside Utah, all earned in the early 1880s: a bachelor’s in medicine from Penn, a second bachelor’s from Philadelphia’s National School of Elocution and Oratory, and her MD from the University of Michigan. In the mid-1880s, during the federal raid on Utah polygamists, she had gone into exile in Europe, pregnant, to help Angus avoid arrest. There, she had visited training schools for nurses, and she had opened her own training school in Salt Lake City in 1889, before entering politics. Celebration of the students’ success would forestall a resurgent Mormon anti-intellectualism until the early 20th century, when conservative members of the church’s hierarchy, even some highly educated ones, began to fear that Mormon scholars’ respect for “the theories of men” had gone too far. They recast students’ enthusiasm as arrogance, their diplomacy as treason. As education turned into the main battleground in the 20th-century war to define Mormon identity, patriarchal scrutiny would often make Mormon scholars rebel or cower. In the tumultuous late 19th century, however, Mormons needed their intellectuals—and American universities—to show them that becoming American would be neither humiliating nor irrational. Thomas W. Simpson is an instructor in religion, ethics, and human rights at Phillips Exeter Academy. He is the author of American Universities and the Birth of Modern Mormonism, 1867-1940 (University of North Carolina Press, 2016), which won the Mormon History Association's best book award.